I have heard such great things about Colleen Hoover, so I finally decided to take the plunge. I picked this book up a while back when it was free on Amazon. I had a craving for a good contemporary read and figured I would give this a shot. And boy am I glad I did. First I have to say that wow, can Colleen Hoover write! Her pacing is perfect. There's nothing slow about this book. It drags you along effortlessly as you're woven into the tale. 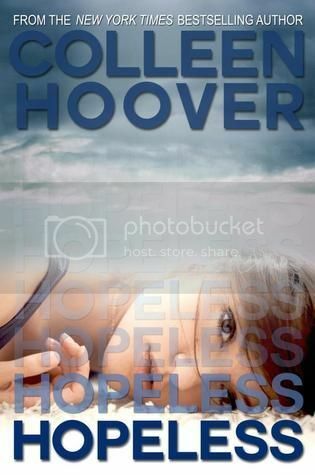 Hoover does a beautiful job of creating characters who are endearing and real. Characters who grab your heart and make you feel every single thing they go through. I'll start with Sky. I love how she's broken but acts as though she has it all together. She doesn't care what others think about her. Ok, maybe she might care what Six thinks about her, after all she is her best friend. And, while she might be nervous to try new things, like going to public school after years of homeschooling, she doesn't shy away from it. She embraces it with all she has. And when her reputation precedes her, she doesn't turn and run, tail tucked between her legs. She turns and addresses those who are bullying her and shows them that it's not going to matter what they do, she'll get past it. But Sky, she has secrets. Ones she doesn't even know she has. And she has emotional detachment, though she has no idea why. Enter Holder. Dean Holder, omgosh this guy is amazing. He's funny and charming, caring and attractive. And he's broken. More broken than this story lets on (you'll have to read Finding Hope to really see what I mean). But his instant connection with Sky is undeniable. Of course it's centered around him thinking she was someone else. But alas, when he realizes she is not, he still wants to get to know her. Because there's just something about her that he can't stay away from. I think my favorite part of Holder is his honesty. He is never anything but honest when Sky asks him questions (though he does hold back some information from her, so I'm not sure how I feel about that). And he only asks the same of her in return. I also love how he's not judgmental. He doesn't let rumors about someone cloud his judgement. He wants to find out about them for himself. Six, I totally love this girl. We don't get much of her, just a few chapters at the beginning of the book, and some text messages. But what we do get shows she's a caring, loving friend who would pretty much do anything for Sky. Of course there are several other secondary characters that you fall for: Breckin for instance. I loved him. He was a great friend for Sky since Six takes off to Italy for a semester! I think some of my favorite scenes in this book were when Sky and Holder were having one of their banter sessions. Hoover takes a darker story and infuses it with light. It's totally necessary or heart would have been on the ground the entire time you were reading. That's not to say she doesn't make you cry, because you will cry (or at least tear up at times). But her ability to make sure she brings you back to a high is what makes me love her writing. Hoover knows how to write moments filled with intense passion and emotion. You can't help but feel everything this book gives you, rather than just hear the story she has to tell. You're pulled into the character's struggles which are real and sometimes completely overwhelming. And just when you think you have the story figured out and you know exactly where it's going, Hoover puts a twist in that leaves you breathless. If I had to use one word to describe this book I would say it is this one: INTENSE. The whole book is infused with an underlying tension that never lets you go. So much so, my heart was often pounding in my chest and I had to put the book down for a few minutes so I could catch my breath. Hoover chooses real and serious issues that often face teens. Issues like suicide and sexual molestation. And she does it in a way that shows it's effects on all those involved. Thankfully, I myself have never experienced any of these issues, but I know others who have. And while they may be thought too deep for teens, I really think it's important that these issues are addressed more often than not. This book is definitely upper YA, bordering on more adult subjects. I recommend parents read it first before allowing their teens to do so. Overall, I think Hoover did a fantastic job at taking the story of two fairly broken people and helping us watch as they uncovered their lives and learned to live again.